This 8-day SCUBA and snorkel trip to Baja, Mexico includes room, board, all activities and all transportation within Mexico. Participants must be 18 or older and hold a current passport at the time of the trip. In 2007 we launched our first ever SEACAMP IV in Baja!! We headed to the small resort of Palapas Ventana situated between the towns of La Ventana and El Sargento, about 35 minutes southeast of La Paz, on the Baja Peninsula in Mexico. The resort is owned and operated by a former SEACAMP San Diego employee and is just 8 ½ miles by boat from the island of Cerralvo which has great diving and snorkeling. (Palapas Ventana Website). Passports are required for all Mexico Trips. International SCUBA and snorkel trip to Baja, Mexico. Session is open to young adults 18 years or older with a current, valid passport at the time of the trip. The session is limited to 20 students. Enrollment is accepted on a first-come, first-served basis and a partially refundable $500.00 deposit is required to secure a student’s spot in the session. Enrollment is accepted on a first come, first served basis and must be done online. A partially refundable $500.00 deposit is required to secure student’s spot in session. Session is open to young adults 18 years or older with a current passport and is limited to no more than 16 students. Get ready for SEACAMP IV! The following schedule is subject to change due to weather/water conditions and may include a snorkel trip to La Paz if whale sharks have been sighted! In addition to the scheduled activities students will also enjoy the Palapas Ventana amenities – kayak, stand up paddle (SUP), relax in a hammock, play ping pong, share photos/videos of the day and identify specific species. Arrive in Cabo San Lucas (SJD) and join the staff from SEACAMP San Diego for a shuttle to Palapas Ventana. Move into casitas and enjoy introductory snorkeling on our beach. After dinner the Palapas Ventana Staff teaches “Spanish for the panga” to prepare for your boat trips. This is another full day at Cerralvo Island. We will dive new spots and explore blue water for dolphins, whales, billfish, turtles, mantas, and whale sharks. After dinner we enjoy a night snorkel on the Palapas Ventana reef that highlights our nocturnal marine creatures. Kayaking and/or SUP excursion for snorkeling and picnicking. Then it’s off to cooking class where we will prepare a Mexican treat and have a feast! Next. we will have a chance to sit back and enjoy local entertainment! Another full day at Cerralvo Island where we will dive new spots and explore blue water for dolphins, whales, billfish, turtles, mantas, and whale sharks. After dinner we are treated to a lecture from a local expert. During a morning snorkel we collect specimens for a touch tank presentation, then learn some information about the animals we have collected. In the afternoon, we will have an opportunity to present the fish and invertebrates that you have seen, studied, and collected. After dinner we head out for a night dive or snorkel. Pangas will take us out for our last day on the water, a day of SCUBA, snorkeling, fishing, blue water exploration and of course…fun!! Afterwards, dinner and a slideshow will be followed by the final evening get-together. After Breakfast at Palapas we head out. Final Goodbyes. Come back soon!! Fly back to United States. $2295.00 per student – $500.00 deposit payment is required with enrollment.The tuition balance along with require forms are due on or before May 15th. meals in Mexico, housing, activities, gear, supervision, SCUBA and snorkel equipment and dive masters. Includes transportation to and from Cabo San Lucas airport (SJD). Transportation to and from Mexico is not included in tuition. Students and families are responsible arranging travel. Deposit and tuition may be partially refundable. Cancellations before May 1st are subject to a $250.00 cancellation fee. Cancellations after May 1st are subject to a $500.00 cancellation fee. All payments are non-refundable after May 15th. Cancellations must be submitted in writing and received by the dates stated above. Registration Forms cannot be found online. All forms will be sent after enrollment via email to the address provided as part of the Student Registration Packet. All complete, original Registration and SCUBA Forms (if applicable) will be required for each participant – scanned, faxed, or electronically signed forms will not be accepted. Before forms are mailed please make sure all required parent signatures and initials are filled out correctly – time and postage is wasted if we have to request a registration form to be re-done. We cannot allow students to attend SEACAMP San Diego if their parents or guardians refuse to sign the Registration Forms or modify the Registration Forms. All required paperwork – Registration Forms, Tuition Information Form, Travel Information Form, and SCUBA Forms (if applicable) must be returned with final payments on or before May 15. Original forms are required – scanned, faxed, or electronically signed forms will not be accepted. Please mail forms to SEACAMP San Diego, PO Box 711310, San Diego, CA 92171. Students must have a valid passport to travel internationally. Travel to and from Mexico is not included in tuition. Students are welcome to travel with the SEACAMP Staff, flights are listed below. Flight should arrive into Cabo San Lucas (SJD) before 3:00pm to be served by the complimentary arranged shuttle. Flight should depart Cabo San Lucas (SJD) after 1:00pm to be served by the complimentary arranged shuttle. Students and SEACAMP staff will be housed at Palapas Ventana in small casitas. Please visit the Palapas Ventana website for more accommodations information. The Palapas Ventana Restaurant is where students will have breakfast and dinner most days. The restaurant will also provide lunch to be eaten in the field. 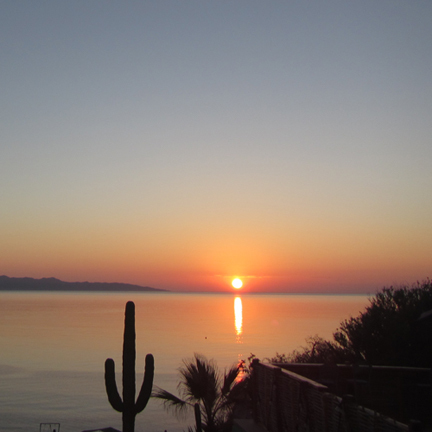 The restaurant is on the east tip of the property and overlooks Cerralvo Island and the Sea of Cortez. It offers the finest Mexican/American cuisine. Besides a moderate sized dining room and large patio, there is also a bar, a ping pong room, and an internet café. In addition, there is a small pool for students to cool off in the evening.